What was that? The best cheap gaming laptop you say? Does such a thing even exist, or is it some ethereal, mythical thing, like Shenmue III? Finding an excellent budget laptop that is fast, fluid, and can still handle playing demanding titles is like the trifecta of gaming. But getting there takes tons of time and research. There are so many different devices, and it’s easy to get lost in all the options. That’s why we’ve compiled this awesome list of the best budget gaming laptops below, with a detailed overview of the pros and cons of each. 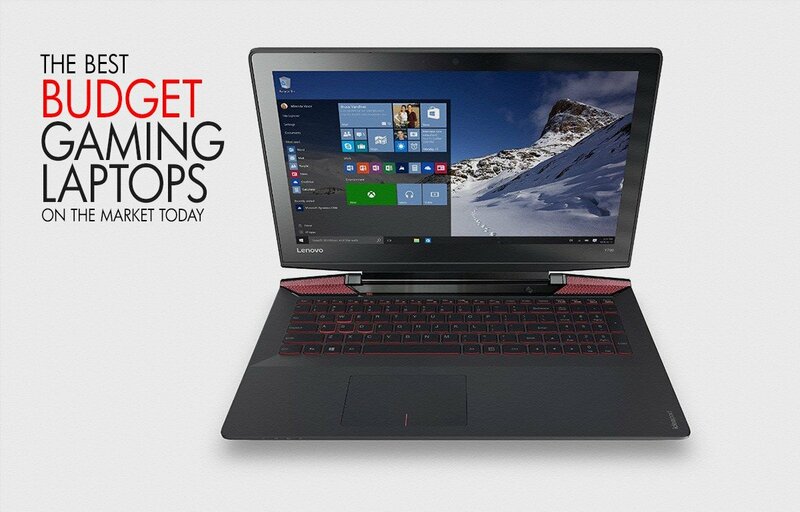 If you’re on a budget, and looking for an affordable gaming laptop, we’ve got you covered! Although the budget of these laptops varies, only the notebooks with an excellent price-performance ratio were chosen. Whether you’re looking for a $1000+ device that can handle the latest games at extremely high details or a very fluid frame rate, or if you’re looking for a less costly device that still manages to handle most games – we’ve curated an option for you. 2 So, what is the best cheap gaming laptop for me? 2.1 It also depends on what type of gaming experience you’re looking for. The Inspiron 15 series by Dell doesn’t really have the looks of a gaming laptop, but as we all know, looks can be deceiving. The 7559 is an extremely decent mid-range laptop with a great and modern design, speedy performance and a snappy NVIDIA GeForce GTX 960M with four gigabytes of GDDR5 video memory. Most other laptops in this price range with the GTX 960M only offer half that amount of memory, effectively making the Inspiron 15 much more future proof for memory-intensive titles. The GTX 960M is more than capable of delivering great performance in Full HD resolution and a fluent framerate. The main attraction of the Inspiron 15 7559 is its beautiful and brightly lit display. The IPS-panel ensures fantastic viewing angles and great color reproduction. The Full HD resolution provides a clear and sharp image on the 15.6-inch screen size. Dell has also equipped the display with an anti-glare layer for better readability in sunlight and less annoying reflections. The processor used in this laptop is rather mid-range, but that’s totally acceptable given the price tag this device carries. We’re talking about an Intel Core i5 6300HQ based on the Skylake architecture which is more than speedy enough for daily operations and can handle demanding games as well. The CPU has been paired with 8 gigabytes of low-energy DDR3 RAM memory and there’s an additional memory slot available for upgrades to 16 or even 32 gigabytes. The laptop supports connection via Wi-Fi ac and has three USB 3.0 ports for easy connectivity. As you might expect with cheap gaming laptops, the battery life isn’t that great under full load, but you’ll still be able to get a pretty decent battery life of 4.5 hours out of this device when you’re not playing games. In terms of storage, the Inspiron 15 7559 comes with a 256 GB solid state drive installed in the laptop’s M.2 slot. This leaves room for an additional hard drive or SSD to be installed to increase the storage capacity yourself – everything in the Inspiron 15 is easily accessible and easy to replace. Other eye-catchers are the illuminated keyboard and the number keys. The weight is slightly on the higher side, as the device weighs in at just around six pounds. The Dell Inspiron 15 series is a perfect mix of performance and price, and is definitely one of the most interesting cheap gaming laptops on the market today. A great display, speedy GPU and plenty of possibilities to upgrade – what’s not to like? 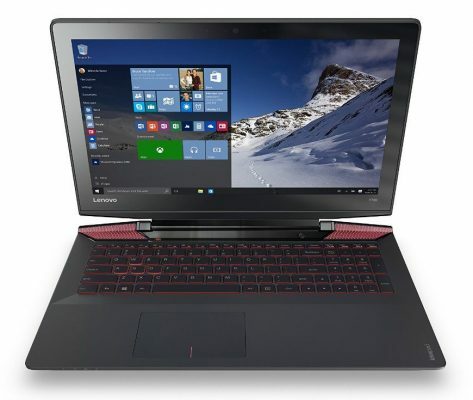 The Lenovo Y700 series feature an aggressive look and that also translates into the laptop’s specifications: like most other notebooks in the price range, the Y700 comes equipped with the excellent GeForce GTX 960M, with the maximum 4 GB of video memory. What’s more remarkable however, is the very speedy Intel Core i7 6700HQ processor operating at a 2.6 GHz. The Skylake-based CPU features hyper-threading for improved performance in a number of gaming situations. This also makes the Y700 more suitable for photo or video editing. The somewhat extravagant design of the Y700 not only results in better ventilation, but the laptop was also designed with the excellent and immersive JBL speakers in mind, giving you a decent Dolby Home Theater experience. Lenovo uses an IPS-panel for its 15.6-inch display for vivid color reproduction and excellent viewing angles. As you’d expect, the resolution is Full HD which makes for great and sharp image quality. You can find the Lenovo Y700 in both a number of variants, but the option with the 1TB hard drive and 8 gigabytes of memory is the best overall choice. A caveat of this device is the absence of a solid state drive. Luckily, you can just pop in an M.2 SSD at any time and you’re also able to expand the internal RAM memory. The motherboard supports Wi-Fi AC and there’s one USB 2.0 and a duo of USB 3.0 ports available. Battery life in a non-intensive scenario is generally four hours. A numeric keypad is available and the keyboard itself is also backlit – great for finding those pesky controls in the night. In short, the Y700 comes with a very beefy CPU, a more than capable GTX 960M and plenty of upgrade possibilities. That being said, you might want to keep an eye out on an M.2 SSD to go along with the most popular variant of the Y700 for quick boot- and loading times. When it comes to laptops with a lower price point, it’s hard to find a device that fits all the requirements of playing the occasional video game. The Acer Aspire E5-574G, however, is one such beast. It may look like your average mid-range notebook, but the device actually packs quite a punch. Don’t expect to see fantastic performance, or the best possible image quality, but for a mere 500 bucks, the E5-774G is a serious contender. Let’s start right away with the most important specifications. Acer has chosen the Core i5 6200U processor based on the Skylake architecture. Keep in mind that this is a U-class processor, which means slightly lower performance in favor of increased battery life. There’s a generous eight gigabytes of DDR3 memory available and surprisingly this laptop also supports the latest Wi-Fi AC standard. The GPU of the Aspire E5-574G is a NVIDIA GeForce GT940M. Although we wouldn’t recommend this GPU for intensive gaming with maximum details, the 940M is more than capable for running recent games – albeit with lower graphical settings and/or a lower framerate. Nonetheless, the GTX 940M packs some of the best budget performance you’ll get, and performs much better than the integrated GPU in the processor. The 15.6-inch screen offers a sharp Full HD 1080p resolution, something that’s quite rare for a device in this price range. Understandably, Acer has decided not to include an SSD in this notebook to help with the more affordable price. There is a 1TB hard drive available however, so you’ll have plenty of storage from the get-go. Luckily, you can install an M.2 SSD as an upgrade to get a blazing fast boot time, and much improved loading speeds. The battery lasts an average of five hours under normal circumstances. We’re impressed: The Acer Aspire E5-774G offers you a lot of bang for the buck with a sharp display, decent CPU and a graphics card that’s definitely suitable for some entry-level gaming. For people on a budget, this notebook is definitely the way to go. We know what you’re thinking – this laptop doesn’t exactly look affordable, and if you take a quick glance at its price tag, it’s hard to disagree. 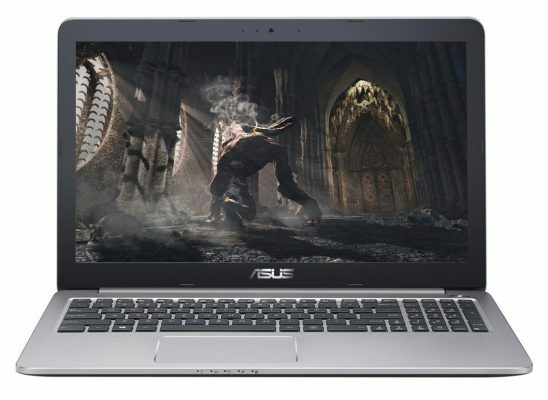 Luckily though, the new ASUS Republic of Gamers series is absolutely worth its asking price. Let’s take a look why this notebook has an excellent price-performance ratio below. Let’s talk about the CPU first. Asus has chosen one of the fastest Skylake CPU’s available from Intel, the Core i7 6700HQ. This is a very speedy processor and is commonly used in high-end laptops such as these. The CPU handles intensive applications and demanding games without breaking a sweat. More importantly however is the graphics card used in the GL502VM. The notebook is powered by the newest GeForce GTX 1060 graphics card by NVIDIA. You’ll also notice that there is no ‘M’ that indicates a slower mobile chip is being used – that’s because the GTX 1060 inside the Strix is the same chip used in its desktop counterparts. The newest generation of graphics cards from NVIDIA are based on the Pascal architecture and provide a much better performance with an even lower power consumption. The GTX 1060 is more than capable of handling the most demanding games in 1080p Full HD resolution with a very fluid framerate and maximum settings. Compared to the desktop version, the GPU has slightly lower clock speeds. The difference is very minimal however and is not noticeable in a real-life situation. In terms of memory, this Asus device comes with 16 gigabytes of DDR4 internal RAM memory. This is a single 16 GB chip that is soldered on the motherboard, but luckily you’re able to just pop in another 16 GB of memory to double it without an issue. The GTX 1060 comes with a whopping 6 gigabytes of video memory, excellent for loading high-resolution textures in the most demanding titles. As you can see the GL502VM comes packed with a lot of imposing horsepower. Luckily, ASUS has also equipped the laptop with a beautiful 1080p display with wide viewing angles and fantastic color reproduction thanks to the IPS-panel. What’s more important however is that the display supports NVIDIA G-Sync for a completely stutter-free experiences. G-Sync is an amazing technology that synchronizes the framerate provided by the GPU with the screen’s refresh rate for the most fluent gaming experience. Republic of Gamers products are built for gamers – the keyboard has been specifically designed with a mechanical-like tactile feeling for the best feedback. And of course, the WASD-keys have been given a special treatment. You might be wondering why we mentioned that this laptop was portable. Although the Strix is packed with impressive components, the design of the laptop is somewhat subtle with a maximum weight of only 4.8 pounds and a thickness of 0.94 inches. In terms of connectivity, the GL502VM does not disappoint at all. Connect your devices with the regular USB 3.0 ports, or choose the newer and reversible USB Type-C port. Wi-Fi AC is also present. You can also use the mini DisplayPort input to easily connect the laptop to a larger display. The ROG Strix GL502VM is available in a number of different configurations. The only difference lies in the storage; all other aspects are identical. The base model offers a speedy 7200 RPM 1TB hard drive. That’s plenty of storage for games and other files, but there’s no speedy SSD present. A slightly more expensive configuration is available that includes a 256 GB Solid State Drive for Windows and your most commonly used programs or games. For the even more demanding users, Asus has also built a GL502VM with a 256 GB PCIe M.2 SSD for insanely fast transfer speeds up to thousands of megabytes per second. This is a vast improvement over the maximum 600 MB/s transfer limit of traditional SSD’s, but it also comes at a noticeably higher price. In short, the ROG Strix GL502VM series isn’t exactly the cheapest offering on the market – but the price-quality ratio is unmatched thanks to the beautiful G-Sync display and the extremely impressive GTX 1060 chip. It’s portable, it’s extremely fast and it’s very, very impressive. Oh, and it also comes with a 1-year accidental damage protection plan. Although the most popular laptop size is without a doubt 15.6 inch, there are still plenty of people who prefer a slightly larger display and laptop. 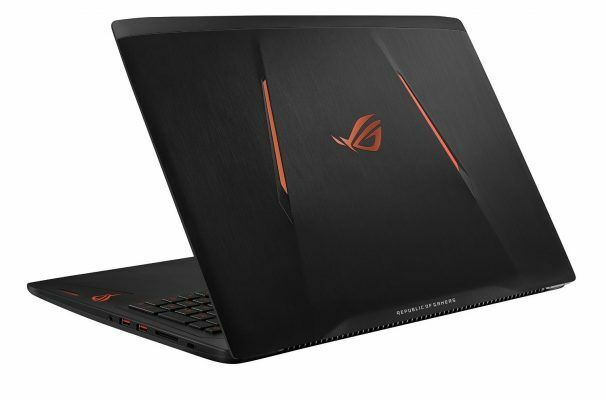 The ASUS ROG Strix GL702VM is pretty much identical to the GL502 we discussed directly above, but comes with a Full HD 17.3-inch display. You’ll still get the same features, extremely fast GTX 1060 and all of the other nice things Asus has provided. 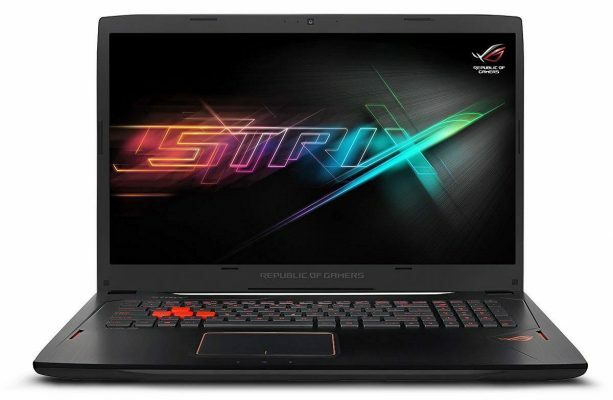 If you’re looking for a high-end 17-inch notebook with the latest components, the Strix GL702VM is absolutely the way to go. Check out our overview of the 15-inch variant above for a detailed run-down of the specs. With its aluminum Glacier Grey look, the ASUS K501UW-AB78 could definitely win a few design prizes. It surprisingly packs a lot of punch in a relatively small body, as it’s equipped with a speedy Intel Core i7 6500U Skylake processor and a GTX 960M graphics card. The U-suffix of the CPU indicates a lower energy consumption for increased battery life, and although the 6500U isn’t as fast as other Skylake processors, it’s more than capable of handling games. We’re looking at a very stylish and polished laptop with a low thickness and high portability. The 15.6-inch screen has a Full HD 1080p resolution for sharp images. Asus has equipped the display with a non-reflective matte finish so that it’s easier to view content on your screen in brightly lit environments. You also won’t notice reflections as much. A nice plus is the backlit keyboard with subtle but effective white LEDs. ASUS has chosen for a rather standard TN-panel so color reproduction and viewing angles are only slightly above average and not exactly eyepopping. But because the price point of the K501 is rather attractive, we wouldn’t want to complain too much. In terms of memory and storage Asus has chosen for eight gigabytes of fast DDR4 memory (which is expandable to 32 gigabytes) and a speedy SSD with a capacity of 512 GB. The SSD comes pre-installed in the laptop’s M.2 slot, but you’re free to replace it with an even faster model and there’s room for an additional 2,5-inch hard drive as well. There are four total USB ports present – two older USB 2.0 ports and a duo of the newer USB 3.0 connections. Support for dual-band Wi-Fi AC is present as well. The K501UW features the looks of a high-end device for a mid-range price and more than enough horsepower to run recent games decently. A great choice if you’re looking for an inexpensive laptop, this one is definitely among the best. For more information, check out our in-depth Asus K501UW-AB78 review. 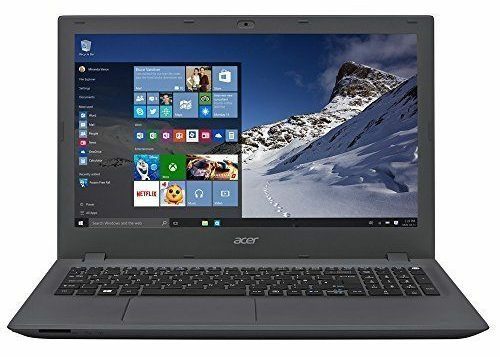 This particular laptop in the Acer Aspire 2016 range of 15.6 inch laptops offers plenty of impressive components for a very low price. Equipped with a beautiful anti-glare Full HD display and a beautiful design with brushed aluminum finish, this device certainly doesn’t look cheap. In terms of processing power this laptop uses a mid-range Skylake processor, the Intel i5 6200U. This is an energy-efficient and is slightly slower than a regular mobile CPU but handles mid-range gaming pretty fluently. There’s a whopping 16 GB of internal RAM memory present, two times as more as other similar laptops – even in higher price ranges. The generous amount of video memory certainly helps if you’re not only planning to game on the device, it’s extremely helpful if you’re planning to do a lot of photo-editing or rendering videos for example: The Aspire 2016 makes rendering large videos a painless experience. It also comes in handy if you’re a large multitasker or if you’re a fan of virtual desktops. Let’s talk about graphics, cause that’s of course the most important aspect of these inexpensive gaming laptops. 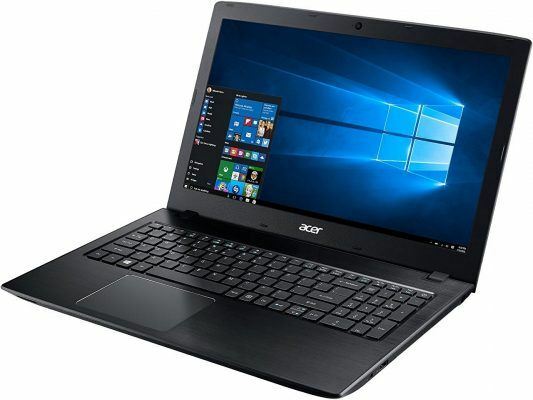 This Acer is equipped with a dedicated NVIDIA GeForce 940MX graphics card which is more than capable of handling some of the latest games. You might have to tone down the graphical eye candy a bit in order to maintain a fluent and stable framerate, but it’s an impressive feat for an inexpensive gaming laptop nonetheless. The 15.6-inch screen has a resolution of 1080p for sharp images. The networking specifications of this device are somewhat strange: on one hand the Ethernet-port is limited to only 100 Megabit per second while practically every other device features a Gigabit Ethernet port. Luckily, wireless connectivity is a lot more impressive with not only support for Wi-Fi AC, but also MIMO – short for Multiple Input and Multiple Output – which allows for stronger and faster Wi-Fi connectivity if your router supports it. There’s plenty of storage available thanks to the 1TB hard drive, but luckily you’re able to install an additional M.2 solid state drive. There’s also a USB 3.1 Type C port present – a nice bonus if you’re currently using a USB-C device. In short, this particular Acer Aspire model is quite a remarkable device. The processor and GPU won’t break any speed records, but are absolutely decent for entry-level to mid-range gaming. You’ll also get plenty of storage with room for expansion and a whopping 16 gigabytes of internal memory. RAM prices have been increasing steadily the past few months, so that’s definitely a major plus. If you’re looking for the best possible gaming experience for the lowest possible price, you can’t really do anything wrong with a Lenovo 250 B01LW0F62Q. The device with a rather long model number is one of the cheapest on our entire list. In terms of overall specifications, a cheap gaming laptop will generally take a step back in image quality and processing power, but that doesn’t mean gaming isn’t enjoyable. In fact, the resolution provided by the Lenovo Z50’s screen is similar to some console gaming experiences – but on a portable laptop. Let’s talk about the screen first. It’s a 15.6-inch display with a regular TN-panel and a resolution of 1366 x 768 pixels. That’s technically an HD resolution, but is definitely not as sharp as Full HD which comes in at 1920 x 1080 pixels. The lower resolution does mean however that games are less demanding to run on which still results in a fluent experience. The laptop uses one of AMD’s Fusion processors which combines a multi-core CPU and relatively beefy graphics card. In this case we’re talking about the AMD FX-7500 which provides AMD R7-class graphics performance. Don’t expect to use high image quality settings or expect to see a very high framerate – but for simple games, this Lenovo certainly does just the job. With eight gigabytes of internal DDR3 memory multitasking won’t be an issue at all for the Z50, and there a 1TB 5400 RPM hard drive present to store a lot of games. The design is fairly simple but it also high quality thanks to the brushed aluminum feel. Also, not unimportant: this Lenovo still has a DVD-drive installed in case you want to play any disc-based videogames. A great choice for casual gamers on a budget with an impressive AMD GPU/CPU combination and plenty of storage. If you’re looking for a premium device in all aspects, the Lenovo Ideapad 700 series offer an amazing amount of value. The price-performance ratio here is remarkable, as it comes with a Core i5 6300HQ processor and other impressive components. The 6300HQ is fast, fluent and also is a regular mobile processor which doesn’t restrict itself in speed in order to save battery; the Ideapad 700 is very much a no-compromise device. The processor isn’t the only thing that’s more than impressive for this price category: the Ideapad 700 is equipped with 12 gigabytes of internal memory (8 GB + 4 GB), which is a vast improvement over the regular 8 gigabytes you often see. This not only allows for better multi-tasking, but also the loading of higher-quality textures and it’s also great for intensive non-gaming tasks as well, such as video-editing. The premium look and feel of the Lenovo Ideapad 700 can be found in every aspect of the notebook. Take the display for example: just like most other affordable gaming laptops the Ideapad 700 packs a 15.6-inch screen with Full HD resolution and although it doesn’t feature an IPS-panel for better viewing angles, image quality is still great. When we’re talking about graphical horsepower Lenovo has chosen for the mid-range GTX 950M graphics chip by NVIDIA. Great for casual and mid-range gaming and a vast improvement over the 940MX that’s found is slightly less expensive devices. It’ll run games fine in 1080p, although you might need to use Normal graphics settings in order to maintain a stable framerate. For a device with a generous price tag such as this one, the GTX 950M is an excellent choice. Where the Lenovo Ideapad 700 really shines however is the storage. The cheapest option has a 256 GB solid state drive pre-installed in the M.2 slot, but it’s actually one that supports extremely high transfer speeds via the PCIe interface. As a result, this SSD is over two times as fast as similar laptops with reading and writing speeds exceeding 1200 MB/s at some point. 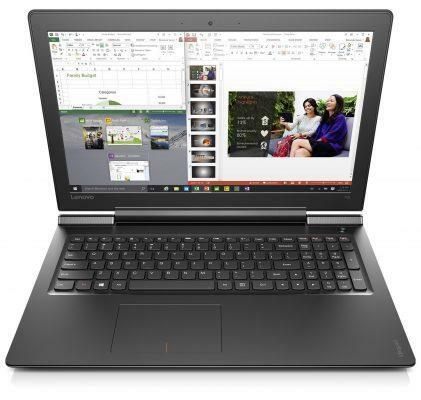 The experience on the Ideapad 700 is extremely fluent and unrivaled in this price category. An impressive processor, a stylish and high-end look, a decent mid-range graphics card, and a blazing fast SSD – that’s the Lenovo Ideapad 700 in a nutshell. If you’re looking to spend a bit more, Lenovo also offers models with a 1TB hard drive pre-installed and an even faster Core i7 CPU. For gaming purposes, the base model with Core i5 will do just fine. The laptops in the Pavilion 17 series don’t look like gaming laptops, and Hewlett-Packard also doesn’t treat them as such. But the processor and graphics card combination used in these inexpensive devices is great for some low-end gaming, making it ideal for playing Minecraft and strategy-type games. As the name already indicates, the Pavilion 17 features a 17-inch display which is a tad bigger than most gaming laptops. The resolution is a tad short of Full HD coming in at 1600 x 900 pixels, but that’s more than sufficient for crisp and sharp image quality in games. The viewing angles are above average but aren’t mind-blowing. The processor HP has used is the AMD A8-7050. That’s a relatively speedy dual-core processor with a standard clock speed of 1.8 GHz. While the pure processing power of the A8-7050 is definitely suitable for the average user – it’s not fit more intensive tasks and operations. What’s more important if you’re looking for a gaming device however, is the graphics chip. Although the Radeon R5 GPU is integrated into the A8-7050 processing unit, it’s still a lot better than most integrated GPU-solutions Intel has to offer. As a result, this laptop with the A8 chip is great for inexpensive gaming. Other specifications of the HP Pavilion 17 aren’t particularly remarkable or exciting. The notebook features only four gigabytes of internal DDR3 memory and a rather modest hard drive with 750 gigabytes of storage capacity. Wi-Fi connectivity is also limited to Wi-Fi b/g/n, so there’s no support for the newer AC standard that works via the 5 GHz frequency. 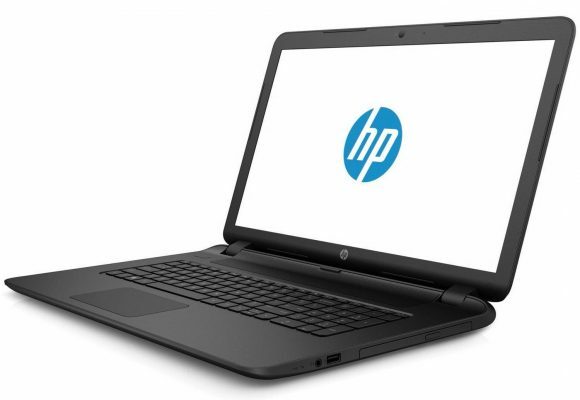 This HP is a good device for its price, but comes just a little short in a number of categories. We’d recommend spending a little bit more, but if you’re looking for a cheap 17-inch device that can handle the occasional game, then the HP Pavilion 17 is a decent choice. 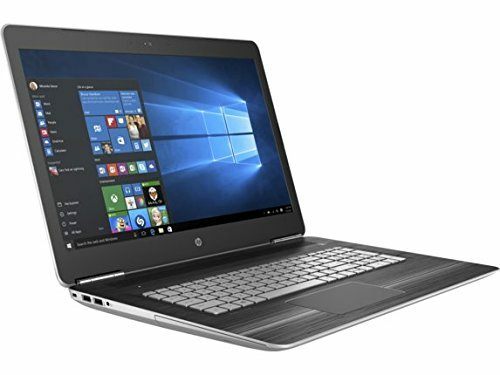 Unfortunately, the amount of available and affordable 17-inch laptops is rather limited compared to the more portable 15.6-inch format but luckily HP has a premium device in its range for people who prefer a larger device: The Pavilion 17T series. The Pavilion 17T shares a similar name and screen size with the regular Pavilion 17 series, but that’s where the comparison ends. The 17T is a vastly superior device while keeping the price quite low. There’s a speedy full-voltage Core i5 6300HQ CPU that provides the machine with plenty of processing power. There’s 8 gigabytes of fast internal RAM memory present and it’s expandable up to 32 GB. Although there’s an mSATA-slot present for a speedy solid state drive, HP has chosen to only include a 1TB hard drive as a storage option. There’s nothing stopping you from installing an mSATA SSD yourself however. The hard drive runs at 7200 RPM and is faster than comparable drives with an RPM of only 5400. The design of the 17T is also pretty great with an all metal look and high build quality. The keyboard features backlight illumination so you continue gaming in darkly lit environments. The display has a Full HD resolution and is outfitted with a great anti-reflective and anti-glare layer. It also uses an IPS panel for better color reproduction and wide viewing angles without color distortion. The GPU used in the Pavilion 17T is quite popular and with good reason: the GeForce GTX 960M is fast and without a doubt the best choice in this price category. Gaming in Full HD isn’t an issue at all, even with the more recent and intensive titles. There’s support for Wi-Fi AC and HP has chosen a high-quality speaker setup from Bang & Olufsen to compliment the device. In short, the HP Pavilion 17T is a great choice if you’re looking for a mid-range laptop with beefy GPU in this format. 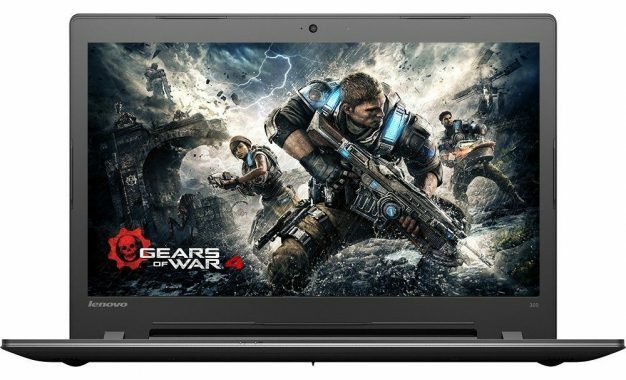 So, what is the best cheap gaming laptop for me? 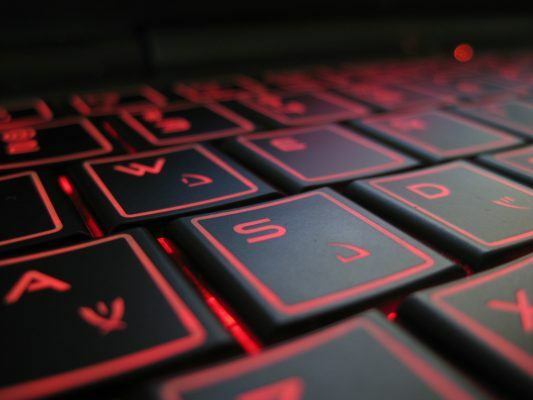 There are a couple of different factors that you have to consider if you’re looking to purchase a new and affordable gaming laptop. One of the choices you’ll have to make is whether you prefer a more compact 15.6-inch display or if you’re willing to go for a larger device with a 17-inch screen size. The latter is a bit more immersive, but price-performance ratio of 15-inch laptops is often higher. It also depends on what type of gaming experience you’re looking for. If you mainly play strategy games, older titles, or games that aren’t really intensive to run – gaming laptops under $500 or $600 are probably the better option. If you’re a casual gamer, look for a mid-range device between $500 and $800, and if you want gaming in high quality, Full HD resolution with a stable framerate you should be expecting to spend at least $800. Of course, there are good gaming laptops available with incredibly impressive specifications but these wouldn’t really fit in the range of ‘affordable’ laptops. As far as we’re concerned, the GTX 1060 such as the ones that are found in the ASUS ROG Strix laptops can be considered the sweet spot for a good price-performance ratio. 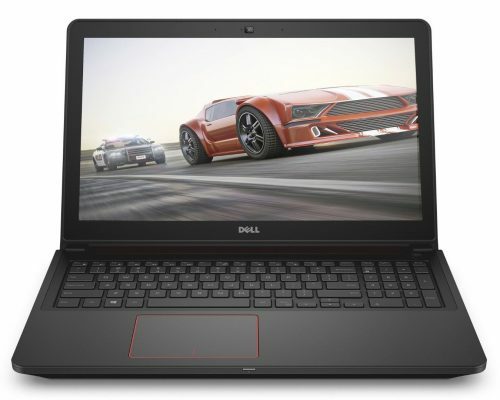 We’re particularly fond of the Dell Inspiron 15 series which will be suitable for most gamers. Looking for something that packs a little more punch? Check out the Lenovo Ideapad 700 for a top of the line premium experience or take a look at the ASUS ROG Strix series which are a bit more expensive, but do feature the amazing GTX 1060 graphical chip. Both devices from Acer are excellent choices in the mid-range spectrum. One thing’s for sure: you’ll definitely be able to game comfortably on every laptop listed above. It just takes a little bit of personal preference and matching with your needs to pick the right one. What are your thoughts on our list of the best budget gaming laptops, or perhaps you know a notebook that would fit right in? As always, do let us know in the comments below.